Are you one of the 20 million+ Americans suffering from a thyroid condition? Did you know that over 60% of people who have thyroid condition remain unaware of them? Or that women are five to eight times more likely than men to develop thyroid problems? According to the American Thyroid Association, more than 12 percent of the U.S. population will develop a thyroid condition at some point in their lives. This week on Lucid Planet Radio with Dr. Kelly, I was fortunate to interview functional medicine doctor and world renowned thyroid expert Dr. Gil Kajiki about the secrets to natural thyroid health, and how the thyroid might be affecting your weight gain. As someone who was diagnosed with hypothyroid in 2014, this topic is incredibly important to me! You can listen to the entire interview on our Soundcloud archive, and learn more about Dr. Kajiki’s story and practice on his website for the Valley Thyroid Institute. 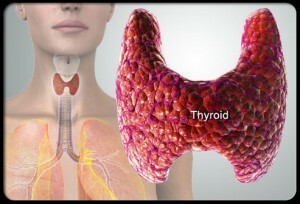 Your thyroid (THY-roid) is a small gland found at the base of your neck, just below your Adam’s apple. The thyroid produces two main hormones called T3 and T4. These hormones travel in your blood to all parts of your body and control the rate of many activities in your body, including how fast you burn calories and how fast your heart beats. All of these activities together are known as your body’s metabolism. A thyroid that is working right will produce the right amounts of hormones needed to keep your body’s metabolism working at a rate that is not too fast or too slow. This is why thyroid problems are often a hidden component in the ability for many people to lose weight: When the thyroid is malfunctioning, the weight will stay on due to slow metabolic processing. What Do Thyroid Conditions Look Like? Hypothyroid: Weight gain, fatigue, dry skin, hair loss, depression, constipation, sensitivity to cold, muscle aches, puffy face, memory loss, and high TSH test. Hyperthyroid: Racing heart, rapid pulse, weight loss, hair loss, fatigue, anxiety, Low TSH test, irritability, hand tremors, muscle weakness, heat sensitivity, and insomnia. Hashimoto’s: Racing heart, night sweats, depression, anxiety, throat swelling, weight gain, hair loss, muscle aches, alternating constipation and frequent IBS, memory loss. Hashimoto’s is an auto-immune condition, meaning that the immune system attacks the thyroid resulting in a combination of hypo- and hyper-thyroid symptoms. What are the 9 Most Common Thyroid Triggers? In order to properly diagnose a thyroid problem or Hashimoto’s, it is very important to conduct tests to see how these triggers are impacting the body. As Dr. Kajiki learned when diagnosing and treating his wife’s Hashimoto’s, traditional medicine often does not conduct the right types of tests to diagnose thyroid problems, and does not interpret them correctly. He spent years researching to uncover the source of his wife’s illness (Hashimoto’s) and dedicated his practice to treating thyroid patients around the world. Because thyroid problems can be so tricky to diagnose, it is imperative to run a series of tests to ascertain which of the triggers are present before the thyroid can be treated. 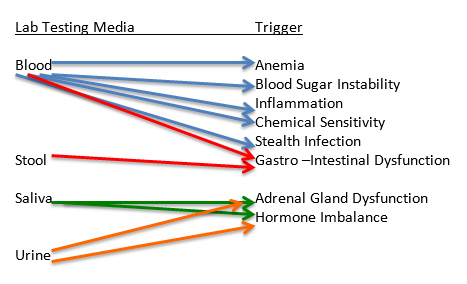 Dr. Kajiki offers this diagram of the different types of tests, which he uses to analyze the thyroid functioning of his patients around the world. Why are Thyroid Problems So Prevalent? On the show, I asked to Dr. Kajiki why Thyroid problems appear to be on the rise. He explained that this is most likely due to the increasing levels of toxicity in our environment, including our air pollution, radiation spilling from Fukushima, toxicity in our water and the prevalence antibiotics and hormones in our food. In addition, many of us have poor diets and consume way too many processed “food-like products” rather than actual natural foods. We drink too much caffeine, we skip meals, and we eat far too much sugar. We also live in a society that seemingly breeds stress, with many of us cramped up in cubicles or with our eyes glued to screens all day long, not getting enough fresh air, sunlight or exercise. It certainly appears that the environment and lifestyle of the 21st century is not particularly conducive to thyroid health. 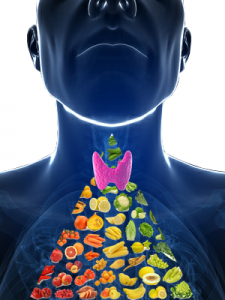 Can Thyroid Conditions Be Treated Naturally? For many mainstream medical professionals, the only way to treat thyroid problems is through medication and surgery. The problem, as Dr. Kajiki points out in the show, is that for 70-90% of thyroid patients, medication alone is NOT enough to solve the problem. Sometimes it can mask the symptoms, but the thyroid is never truly healed. Dr. Kajiki’s thyroid treatment protocol is all about fusing medication (if/when necessary) with major diet and lifestyle changes. As with all functional medicine approaches, the patient must be actively involved in the treatment in order for it to be successful. In other words, if you just want to sit back and take a pill, without changing anything in your life, then a natural approach to any body disorder is probably not the way to go. 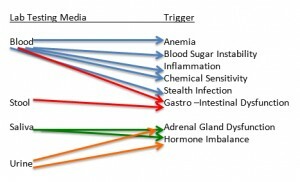 A natural thyroid protocol would be tailored to each individual’s needs based upon how the nine common triggers are affecting their body. Integral to any plan would be a process to clean the digestive system by eliminating any food or chemical sensitivities the individual my have. Since 70% of our immune system is located in our gut, when our gut becomes agitated through toxicities or food sensitivities, our immune system becomes agitated! And when our immune system is agitated this can exacerbate auto-immune disorders. This is why it is imperative to cultivate the microbiome in your gut by eating fermented foods and/or consuming probiotic supplements. For example, one of the biggest changes that I have made since being diagnosed with a thyroid condition 2014 is completely eliminating gluten from my diet. Gluten can be a major instigator of thyroid auto-immune problems due to a process called ‘molecular mimicry’ where the body perceives gluten to be thyroid tissue (because their molecular composition is so similar) and begins to attack the thyroid. Many patients also benefit from being mindful of their consumption of goitrogens, a type of food that can interfere with thyroid function, which include broccoli, brussels sprouts, cabbage, cauliflower, kale, kohlrabi, rutabaga, turnips, millet, spinach, strawberries, peaches, watercress, peanuts, radishes, and soybeans. Dr. Kajiki also says it is incredibly important to each a protein rich breakfast within 1- 1.5 hours of waking up and have a protein rich snack every 2-3 hours to avoid blood sugar spikes. He says that the insulin spikes from eating a diet high in carbs, sugar and caffeine can lead to massive cortisol surges that can throw off the body’s hormonal balance, including thyroid functioning. Increase your consumption of herbs and healthy fats (like flax, hemp, coconut oil, avocado, olive oil, nut butters, yogurt and more) which can be important for regulating hormonal pathways. Get your daily Omega-3s (whether from fish oils, flax, hemp, nuts or grassfed animal products), which are critical to thyroid function and improve the body’s ability to respond to the thyroid hormones. Reduce Inflammation by avoiding foods you might be sensitive to, as well as limiting your intake of alcohol, refined sugar and processed foods. Also make sure to check for toxins in your environment that may be contributing to inflammation, such as mold or any hidden allergens. Boost your antioxidants, like glutathione. While I sometimes have glutathione administered intravenously from my functional medicine doctor, you can also eat certain foods that help the body produce more if it, like peaches, avocado, spinach, squash, garlic, grapefruit, and raw eggs. Make the time to RELAX and de-stress! The thyroid is incredibly sensitive to stress, so make a habit of engaging in practices to bring you into a Zen, chill space. These can include biofeedback, meditation, yoga, breath work, martial arts as well as exercise (which is great for your hormones too!). Even a warm bath at the end of the night or a nice lymphatic massage can help! To find out more about the secrets to natural thyroid health, listen to the full podcast, and if you are seeking medical help or looking for treatment from a thyroid specialist, consider a free 15-minute consultation with Dr. Kajiki to see if his program is right for you.